Q. How do you stop an elephant from charging? A. Take away his credit card! An old joke is now... a new idea. Nearly 48,000 UltraViolet members have signed a petition demanding credit-card companies block sale of assault weapons through their credit card. I'm calling to urge your company to stop helping arm mass shooters by blocking the purchase of assault weapons through your credit cards. You can block the sale of Bitcoin. 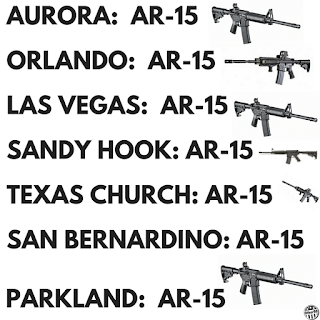 Now block the weapons of mass murderers. Make a call, and tell Ultraviolet how it went. 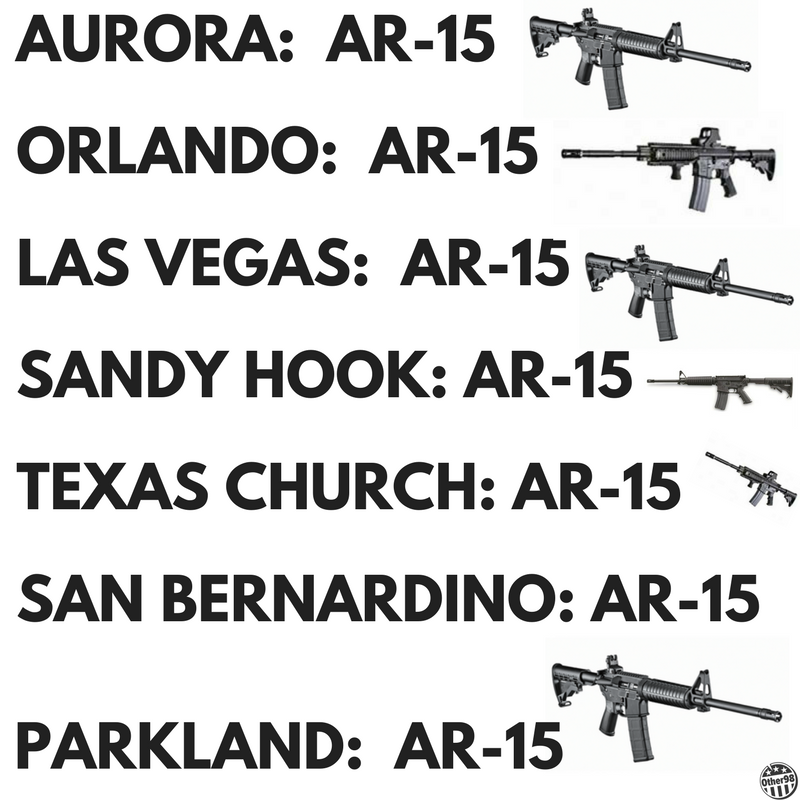 We know that 17 were killed, of many more victims, from random murders by an angry student with an AR-15. It happened at the Stoneman Douglas High School in Parkland, Florida. Few people outside Florida know anything about Marjory Stoneman Douglas. More people should. Perhaps Stoneman Douglas the person is inspiring Stoneman Douglas the students. Marjorie Stoneman was born in Minneapolis on April 7, 1890 and died in 1998, 108 years old. She was a great writer who cared deeply about votes for women and the environment. She is best known for saving from development what is now the Everglades National Park. 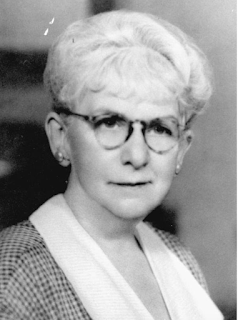 It was a great moment when former Wellesley President Diana Chapman Walsh in her 1993 inaugural speech cited the work of Marjorie Stoneman Douglas and in the next paragraph cited the work of Alice Tepper Marlin! Stoneman Douglas began her postgraduate days with a short marriage to an older man who, alas, turned out to be a con artist. She recovered by joining her father at the Miami Herald, working first as a society reporter, then an editorial writer, becoming increasingly engaged in her profession. Despite the pain he caused her, she retained the name of her ex-husband to the end of her life. After working for the newspaper for some years, she started writing articles on the civil rights of women and others who were not allowed to vote, and on conservation issues. She won a wide readership and published hundreds of short stories. It was the era of The Masses and hard-hitting writing was in vogue. She was less a feminist than an activist. She said: "I'd like to hear less talk about men and women and more talk about citizens." She helped preserve the Everglades against efforts to drain this swamp in favor of development, by writing in 1947 the book The Everglades: River of Grass, which had an impact similar to that of Rachel Carson's later book (Silent Spring, 1962) on the overuse of DDT. 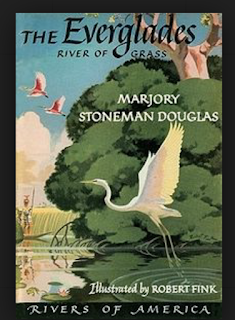 Stoneman Douglas was called "Grande Dame of the Everglades" and was pilloried by developers. She prevailed over the developers, not for the last time. The same year her book on the subject was published, 1947, Everglades National Park was created. The National Park Service ever since has been her friend. In the 1950s, however, the U.S. Army Corps of Engineers became her enemy. The Corps was working with developers to drain swampland upriver from the Everglades. She argued persistently that the Everglades was at the end of a long-tailed system. The Park depended on a flow of water from Lake Okeechobee, and that in turn depended on the Kissimmee River's continuing to feed the lake. Mrs. Douglas was half the size of her fellow speakers and she wore huge dark glasses, which along with the huge floppy hat made her look like Scarlett O'Hara as played by Igor Stravinsky. . . . She reminded us all of our responsibility to nature . . . Her voice had the sobering effect of a one-room schoolmarm's. The tone itself seemed to tame the rowdiest of the local stone crabbers, plus the developers, and the lawyers on both sides. I wonder if it didn't also intimidate the mosquitoes. . . . The request for a Corps of Engineers permit was eventually turned down. This was no surprise to those of us who'd heard her speak. In the history of the American environmental movement, there have been few more remarkable figures. Postscript: Stoneman Douglas reportedly donated her Medal of Freedom to her alma mater, Wellesley College. December 2017 Job Growth, Nassau-Suffolk – 0.4%. Source: BLS (bls.gov), Feb. 6, 2018. February 6, 2018 – If JOBS-JOBS-JOBS is the standard, the first year of the new Administration in Washington, D.C. has failed Long Island. 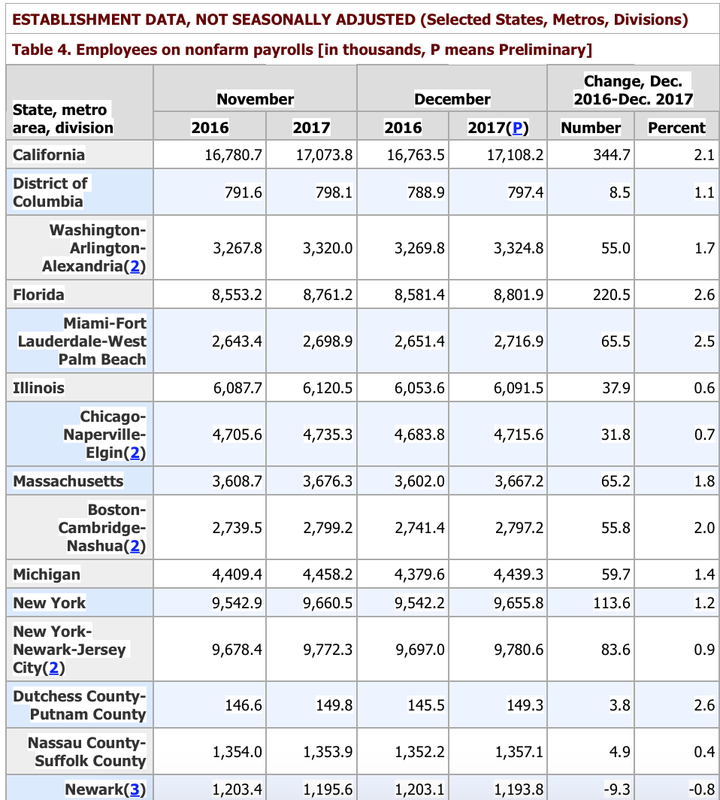 Nassau-Suffolk added only 4,900 nonfarm payroll jobs from December 2017 to December 2018, according to data released today by the BLS. The growth rate of 0.4 percent is one-third of NY State's rate of job growth for the period, and less than half the rate of job growth in the entire tristate New York metro area. It is less than one-sixth of the growth rate in the other major area component outside the core New York City metro area, i.e., Dutchess and Putnam counties. So what has the Republican Congressman representing Long Island's Eastern Half been doing about bringing jobs to Long Island? His latest post on the topic on his official website was during his last campaign year, 2016. (For a general summary of Zeldin's political positions, go here. He rode in on the howdahs of the Tea Party Republicans. His votes and public statements peg him as a "libertarian conservative", an oxymoron since conservatives are anti-libertarian on social policies. Zeldin thinks that Suffolk County, which depends on clean water and air for its tourism and leisure-living businesses, and was clobbered by the Meltdown of 2008, needs less environmental and financial regulation. That doesn't seem to have worked so well for Suffolk County. Make It Easier to Pollute and Rip Off Financial Customers by allowing Congress to block regulation of the environment and financial fiduciaries. Make Environmental and Financial Regulation Harder for the Executive Branch to implement! Read below, in its entirety, Zeldin's proposal in March 2016 for creating jobs on Long Island. During my first 14 months in Congress, I have constantly heard from business owners on Long Island sharing stories about how various examples of bureaucratic red tape out of Washington has made it increasingly difficult to create more good paying, private sector jobs. The Department of Labor “Fiduciary Rule,” the EPA’s effort to put the motorsports and custom car industry out of business, and the attempt of federal regulators to impose overzealous Dodd-Frank regulations on auto lenders are just three of many new federal agency regulations that harm the business climate on Long Island and throughout our nation. 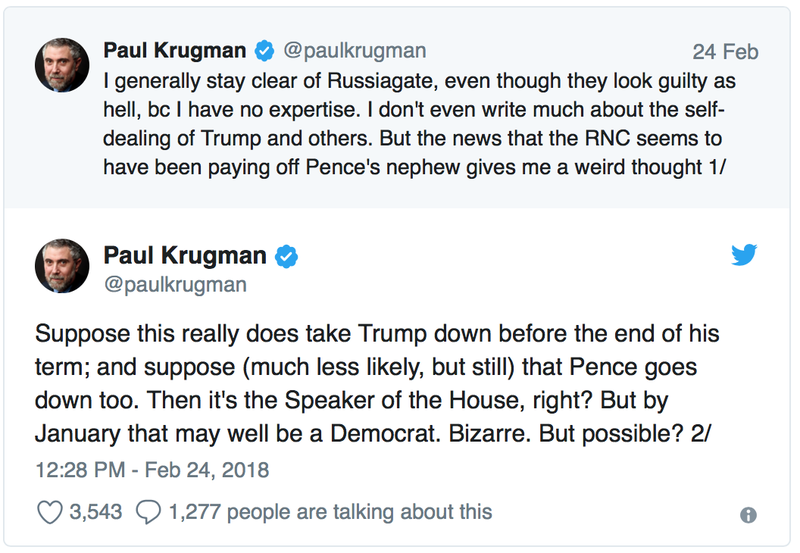 As each new rule is passed, we are reminded of why it is so important for Congress to pass the Regulations for the Executive in Need of Scrutiny (REINS) Act (H.R. 427). Example #1: Many Long Islanders, when seeking something as critical as life insurance or retirement savings advice, want to go to a trusted broker who is a part of their local community. Planning for retirement and managing a family’s investment portfolio to save for college or buy a new home is an essential piece of the American dream. The Department of Labor, through its “fiduciary rule,” is shutting down that dream by overregulating independent financial advisors and life insurance brokers out of business. By imposing regulations and fees meant for larger, multi-billion dollar Wall Street firms, the one-size-fits all approach proposed by federal regulators would kill an industry that is run by small entrepreneurs and built on personal relationships. By the Labor Department’s own admission, in 2010, those individuals who did not seek or have access to investment advice suffered over $100 billion in financial losses through investment mistakes, which could have easily been avoided with the appropriate level of consultation. Saving for retirement is of crucial importance to American families and access to professional financial advice should not be hindered by an unnecessary regulation put in place by unelected agency bureaucrats creating rules that carry the force of law. Example #2: The Clean Air Act has been a resounding success and in Congress I have been an outspoken advocate for clean air and clean water on Long Island [???]. The EPA is attempting to go around Congress, ignoring the Constitution by creating new interpretations of this law, which would hurt small and medium sized businesses. Current rules proposed by the EPA would effectively shut down the motorsports and car modification industry by imposing the same level of regulations meant for power plants and other major industries. By banning certain modifications made to cars and motorcycles, and applying these misguided regulations retroactively, hobbyists, who have invested countless time and money into their cars, would suddenly be in violation of a set of federal regulations that were never vetted by their representatives in Congress. Small and medium sized businesses on Long Island, like American Racing Headers, that supply specialty automotive parts to customers nationwide, are already seeing a reduction in business as a direct result of the threats surrounding these new rules. Example #3: The indirect auto loan market just surpassed $1 trillion, making it one of the most essential, and competitive financial markets in our economy. In a misguided change of policy, based on flawed statistics, the Consumer Financial Protection Bureau (CFPB) is attempting to shut down transparency in the auto lending market by mandating new standards that they falsely believe will increase fairness in the market. Consumers on Long Island should not be cut off from needed credit due to arbitrary government regulations. A transparent and competitive auto lending market means consumers will get the best rates, but bureaucrats in Washington want to impose strict Dodd Frank financial regulations meant for Wall Street that would shut down the indirect auto loan market so essential to main street Long Island. What has always made America so great has been the opportunity to succeed through hard work and dedication, but unfortunately today, economic opportunity is being stripped away with oppressive taxes and burdensome red tape on America’s businesses. President Obama’s first seven years have brought forth 468 regulations deemed “economically significant rules”, and that’s with just under a year still to go. (CEI) The Fiduciary Rule, the attack on the motorsports industry by the EPA, and the CFPB’s attempted overregulation of auto-lending, are just three of the rules that have made it harder for business owners to succeed in today’s economy. If this is the best that Zeldin can come up with to create jobs on Long Island, no wonder jobs have grown only 0.4% during the year. Long Island needs better ideas. 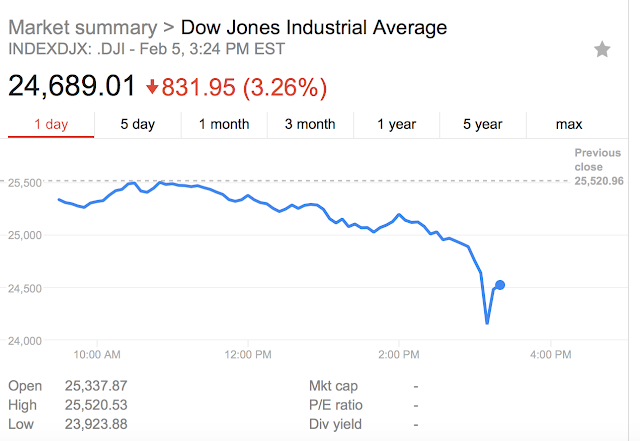 a record intraday drop of 1,607 points. The intraday Dow suffered a record point drop of more than 1,600. It recovered somewhat, ending the day with a record point drop for the day of 1,175, more than 4 percent. I am collecting "explanations". Take your pick. Send me an email* on which ones you believe and I will re-rank these reasons to reflect a consensus. 1. Treasury bond yields have risen sharply in recent weeks. So smart money is betting on higher interest rates. 2. Outgoing Fed Chair Janet Yellen announced before she retired that the Fed is committed to raising interest rates, so maybe you didn't have to be quite so smart to see this coming. 4. Hey, the market was overvalued, maybe by 20 percent. We knew this was coming. Investors were just cashing in after the rally in stocks since the GOP victory in November 2016. 5. Friday BLS data showed rise in hourly earnings for workers. Fed said it saw signs of inflation – i.e., it read the BLS data same as we did. 6. The BitCoin et al. Bubble. 7. Baby Boomers who are retired or are getting ready to are gradually exiting stocks, using the old rule of "100 minus your age" in stocks. Their problem has been where to put their money while they wait for interest rates to rise; rising rates offer more opportunities. 8. A new Fed Chairman creates uncertainty. GOP tax cuts will increase the deficit but mostly won't put money in hands of people who will spend it. 9. A stagnant economy may be in the cards. 10. May be the beginning of a long-overdue corrective bear market. PBS has since published a list of the Top Five reasons the market is crashing. I have edited the list above slightly after reading this article. The Vero Beach Insider is a radio show that focuses on female entrepreneurs in the Vero Beach, Florida area. The January 31, 2018 show celebrates the Feb. 9-11 Fourth Annual "Art on the [Marsh] Island" Show. Marsh Island is on the mainland end of the Wabasso Bridge, which my wife and I call the Five-and-Dime Bridge because is it State Road #510. (Get it? 5 and 10?) It connects the Barrier Island with Sebastian, Florida. We went to this show last year and it was worthwhile. The whole Marsh Island development is of interest. To listen to the interview, click here and start listening at the 9-minute mark. And don't forget to come to the show on February 9-11. See you there, maybe. The November increase was revised down from 252,000 to 216,000. The December increase was revised up from 148,000 to 160,000. The net change was that gains in payroll jobs in November and December combined were 24,000 fewer than previously reported. After revisions, job gains averaged 192,000 per month over the last 3 months. A moving average is more reliable for payroll job changes. Each month, prior data is revised based on additional reports and recalculation of seasonal factors. Noise in the reported numbers is especially likely during the annual BLS benchmark process at the end of each year. Employment continued to trend up in construction, food services and drinking places, health care, and manufacturing:. Food services and drinking places employment continued to trend up in January (+31,000). The industry has added 255,000 jobs over the past 12 months. Health care continued its long and steady record of adding jobs in January (+21,000), with a gain of 13,000 in hospitals. In 2017, health care added an average of 24,000 jobs per month. Manufacturing continued to add jobs (+15,000). Durable goods industries added 18,000 jobs. Manufacturing has added 186,000 jobs over the past 12 months. Other major industries were little changed, including mining, wholesale trade, retail trade, transportation and warehousing, information, financial activities, professional and business services, and government. The January unemployment rate was 4.1 percent for the fourth consecutive month. The number of unemployed persons was 6.7 million, changed little over the month. Full data are at www.bls.gov. Among major worker groups, the unemployment rate for Blacks increased to 7.7 percent in January, and the rate for Whites declined to 3.5 percent.